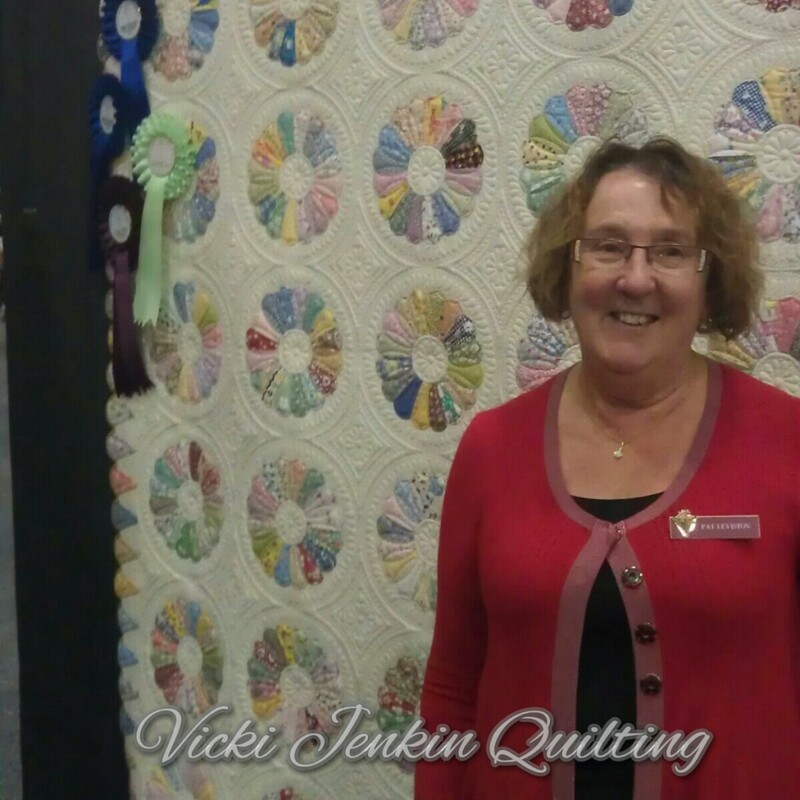 I spent most of last week at Victorian Quilters Showcase which is held at the Melbourne Exhibition and Convention Centre, in conjunction with the Craft and Quilt Fair. It is always a fun time, I love being surrounded by beautiful quilts and lots of quilt loving people like me. I have to say the best part is seeing the friends who I have come to know simply due to my involvement with this show over the past nine years, I love seeing each and every one of you and also meeting new friends, there is always a couple of them each year too. This year was unusual for me in that I didn’t enter any quilts, but I did have three customers who entered quilts which I had the privilege of quilting. They all looked fabulous hanging in the show, as did all the quilts. Congratulations to everyone who entered, it is thanks to you that there is a show for the rest of us to enjoy. The hard working organising committee do a fabulous job, it is mind boggling the precision planning that goes into this show, congratulations to Mary and Margaret and the team! 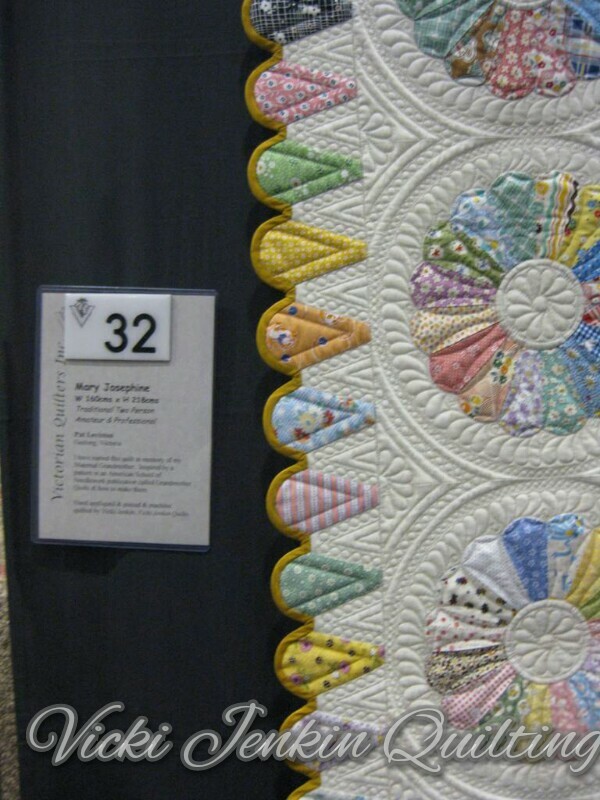 Here is my friend and customer Pat Leviston proudly standing with her quilt called Mary Josephine. She won one of the major awards the “Retaining The Tradition” award, as well as First in her category and also a Judges Award. 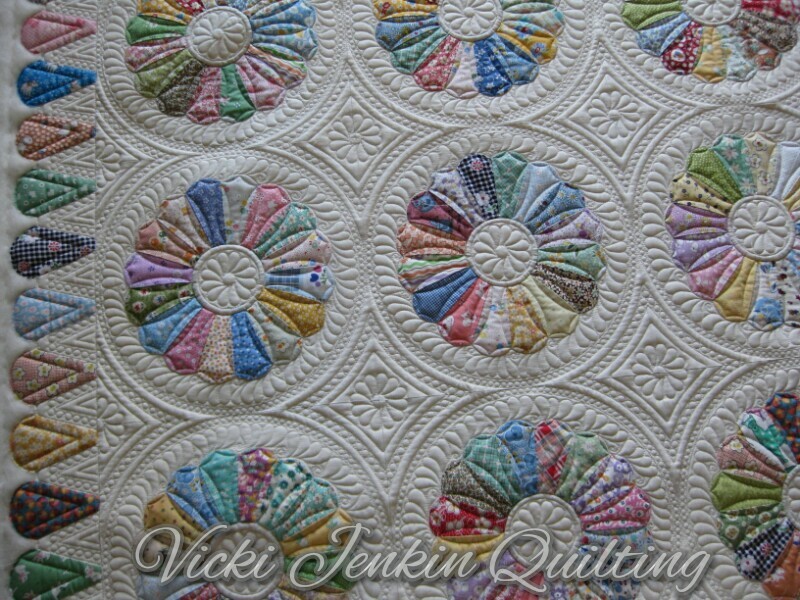 I quilted this quilt very early this year, loved doing it and I was very pleased with the final look achieved. It is a combination of hand guided and computerised quilting and was quite a learning curve along the way. The quilting design was originally destined for another quilt that I quilted in 2010, but at the last minute the piecer changed the design of the quilt top so this no longer worked for that quilt. It has been sitting in the back of my mind ever since waiting for the right top to come along and Mary Josephine was the one! 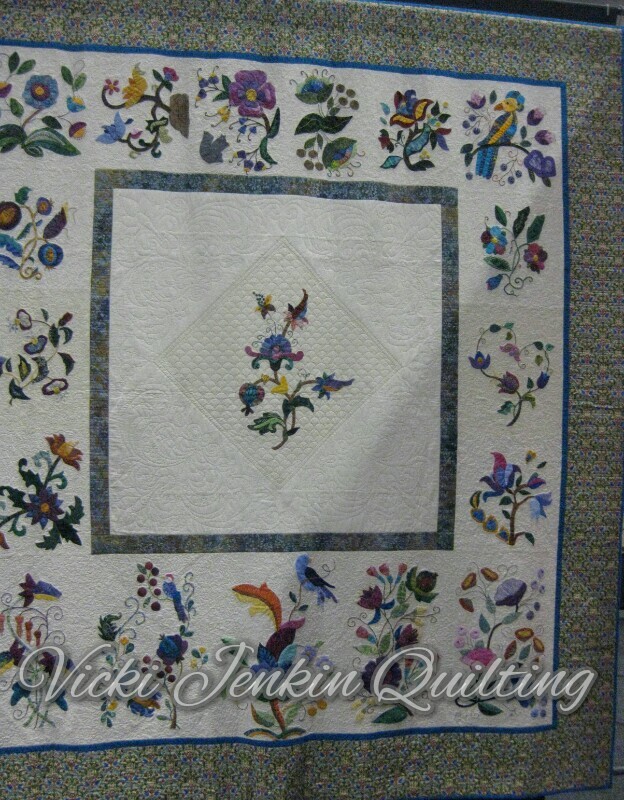 The binding on this quilt was extremely challenging and Pat applied it totally by hand, front and back, to achieve the precision it required….she did a fabulous job. Not only did she have to bind all those tiny scallops but the space in between was less than an ich long and required two mitres….that is ALOT of mitres!! 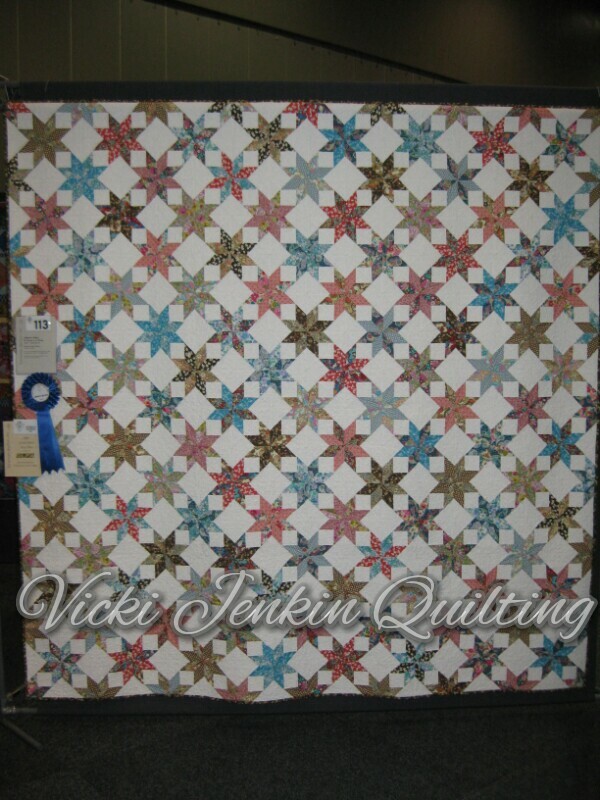 Liberty Stars made by Pam and Emma Jansen from Ballarat Patchwork was awarded 1st place in group quilts, this quilt is large and has lots and lots of stars. 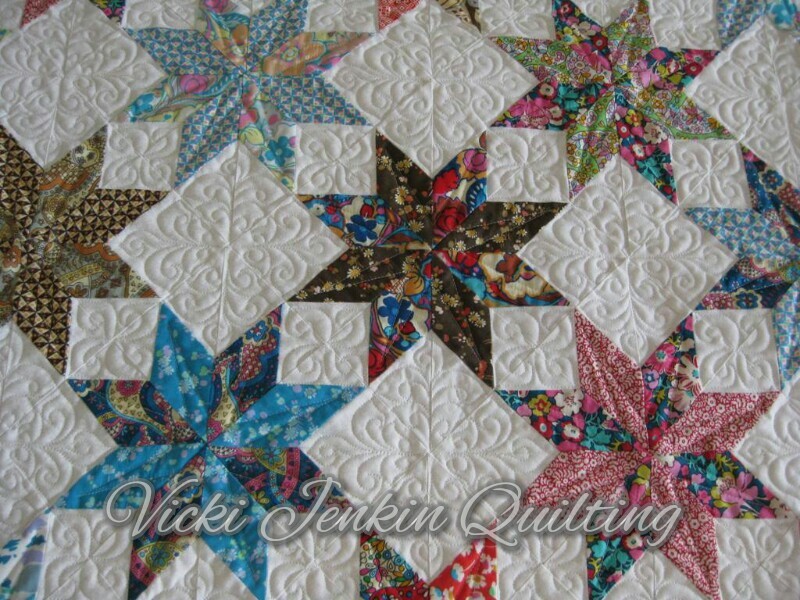 During the quilting process it was fondly referred to as “never ending stars”! I have quilted a number of Emma’s quilt and she always give me free rein on the quilting designs, sometimes that is great, sometimes it is daunting. Next up is Lizz’s quilt, My Jacobean Beauty. This was a friendship quilt made by the members of Stawell Quilters and it looked fabulous hanging in the show. Lizz had a fairly definite idea about the quilting designs she wanted on her quilt and I think they complement the top very well.